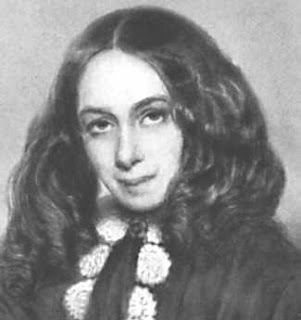 Elizabeth Barrett Browning is famous for being an English poet and for marrying poet-playwright Robert Browning. I'm going to reserve the whole Harlequin-esque romance story for another time, but she married him on September 12, 1846, despite her father's objections. Her worry about marriage was that she might be a burden to Robert because of her illness, which was diagnosed differently at separate times. Was it a lung ailment? No one knows for sure, but she was introduced to opium (laudanum, specifically) to relieve the symptoms and depended on the drug the rest of her life. Her obsessions with poetry and books began in childhood. She was home-schooled, you might say, and learned Greek, Latin, and several modern languages while just a child. At one point, she vowed not to marry, saying that poetry was enough for her. Ironic, for the love story of Elizabeth and Robert is legendary. The famous line "How do I love thee? Let me count the ways," is from a collection of love sonnets she wrote and entitled Sonnets from the Portuguese. The title was her and Robert's attempt to disguise that the sonnets are about their romance. The work is not about the Portuguese one lick. Sadly, Elizabeth died on June 29th, 1861, at the age of 55, from her mysterious ailment. Here is her lovely portrait. I will refrain from immature comments about her hairstyle. So totally 1850s. Here is her Wiki Page. Here are Books about and by her. Source Articles: Elizabeth Barrett Browning; The Life of Elizabeth Barrett Browning; Elizabeth "Ba" Barrett Browning. Interesting to know what Sept. 12 was. Davalyn...Ha! I made a comment in my notes for this date "El. Barrett Brng" which I thought meant her birthday. It meant her marriage! I have changed my notes to reflect that and also commented on the March 6th date that THAT is EBB's real birthday. I should have double-checked my research. Hope you enjoyed the article anyway!